Squad - The Next Big First Person Shooter? Squad is an upcoming online standalone first-person shooter that supports up to 100 players per game. 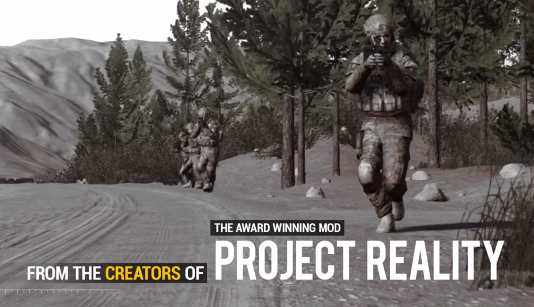 It is being developed by the team that brought us Project Reality, the very popular Battlefield 2 modification that gave the game a more realistic vibe. Over 21,000 people have said yes to the idea of this game, and is now #2 on Steam's Green light ranking system. According to the developers, it will be available in early 2016 for PC and Linux. Believe it or not, the team behind developing this game does not have a tremendous amount of staff, in fact there are a total of ten people working on this new title. The creator and lead developer goes under the alias, Merlin91 on Steam. The developers are very secretive when it comes to their upcoming project. Hopefully, sometime in the near future, I will land an interview with one of the developers to hear more about how their team started. Other than that, little information is known about the team at hand. The maps are fairly large in size, which gives it a Battlefield-like atmosphere. The developers built their new game from scratch using Unreal Engine 4, which allowed the Project Reality team to design larger and more robust maps. Furthermore, Squad will incorporate realism, communication tools, mod support, the option to switch through a plethora amount of kits (i.e. machine gunner, sniper, grenadier, APC-crewman, helicopter pilot, squad-leadership, construction engineer, medic, and more), and a basic resupply system. Maybe you are not interested in patrolling enemy territory on foot. Do not fret, because the developers are hoping this game will be great for everyone. Players will also have the opportunity to join a unbeatable army of tanks to invade enemy bases. Players will also have the ability to lock n' load inside attack helicopters and APCs. Some of you may ask, why is this better than Battlefield? Squad uses Geographic Information Systems satellite data to give players the opportunity to destroy their enemies in realistic environments. Below, you can find a quick preview of what is to expect. After watching the trailer, I quickly formulated a opinion about Squad. There is a lot of resemblance between this game and the Battlefield series, from the enormous maps to the classes. It looks like an amazing new experience just begging to be played. I am excited to see a well-built first person shooter that is not Call of Duty or Battlefield. I will definitely be purchasing it within the first week of it being released. This games sounds like complete and utter chaos. Teams of 50 players versing another 50 players, come on, that sounds like a lot of fun. According to the developers, they are implementing modern day weapons and vehicles to give players that extra rush. How does everyone else feel about it?